I ended up taking the wrong side of the loop track going around Osaka (大阪) and it took me a lot longer to get to a stop where I stopped for some lunch at a McDonalds (it’s annoyingly convenient and cheap), got myself some beer and headed for the park. The sights at the park were great, but there really weren’t that many cherry trees there. I walked for a while and reached the concentration of foreigners soon enough. My stay at the park was very short due to Rising Gaijin taking the people (me included) to an after party – right after I arrived. We went to Tin’s Hall in Tennoji (天王寺) area of Osaka (大阪). I would\ve wanted to go there so bad as a kid. In the end there were not that many cherry trees in this park. At the bar, a lot of drinking shenanigans went down – something you expect when you hang out with other foreigners – and eventually someone (not a foreigner, mind you) was throwing out glasses outside of the bar and some people were having fun with a small, old guy (apparently a CEO of some local company). Eventually people just scattered and me, being dumb, bought more alcohol, thinking that the party would still go on. I saw the people I was with off before idling around for a while, ending up at McDonalds and finally back at Tin’s Hall. A bunch of people I didn’t know. More people I didn’t know. I must’ve spent an hour just sitting at this spot. 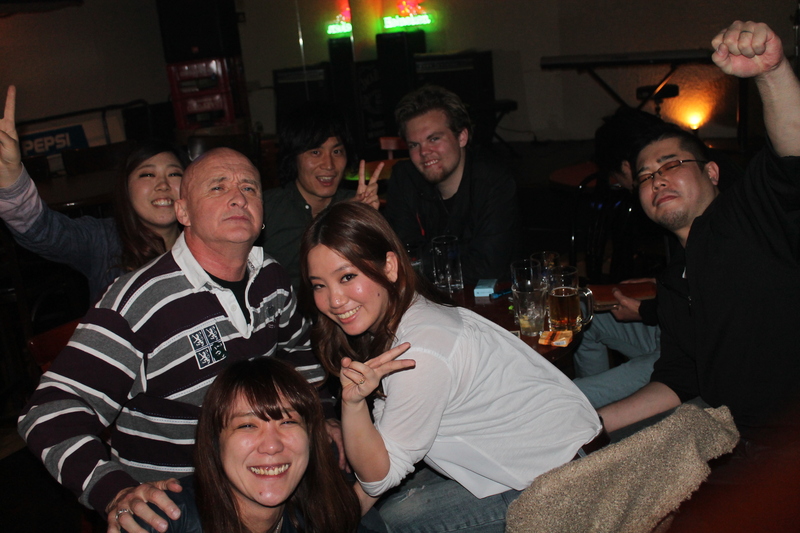 I met some Japanese people and a pretty awesome western guy at the bar; I had some fun talking with them and got a picture with them before I left. When leaving, the western guy came to me and wanted to show me a cheap-ish hostel right around the corner. I followed him, thanked him and went in. Unfortunately they were full, so I went out to wander the streets – something that I would very much regret later on. I wandered around in a similar fashion to when I was going around in Kazusa-Kameyama (上総亀山) until I got to a FamiMart to buy myself some food. Based on the receipt time stamp, this was at 03:14. From there I only remember that I ate my food next to a bum – from this point there is a huge gap in memory; I blacked out. This is where the fifteenth day ended. The following day the regrets will come in. No count made, too busy being drunk.